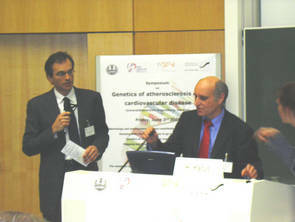 The invitation of Prof. Hengstenberg to the symposium "Genetics of Atherosclerosis and cardiovascular disease" in Regensburg on June 3rd/4th 2005 was accepted by more than 150 german and international Scientists. As the host of the symposium Prof. Hengstenberg opened the symposium followed by welcome remarks from Prof. Riegger (Regensburg), Ms. Betz (Mayor of Regensburg) and Prof. Katus (Heidelberg). 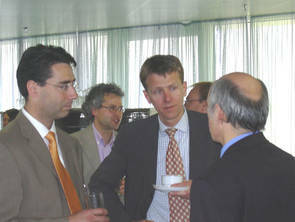 The two days of the symposium where filled with 30 top class lectures with new data and reviews. The seven scientific sessions encompassed epidemiological, environmental, genetic results on special cardiovascular phenotypes as well as metabolic aspects and animal models. Stimulating discussions where continued in the coffee breaks wheres the evening of the first day was topped off by a wonderfull dinner in the Herzogssaal. 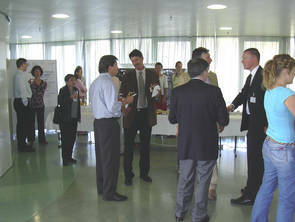 A small industry exhibition took place in the foyer of the lecture room. 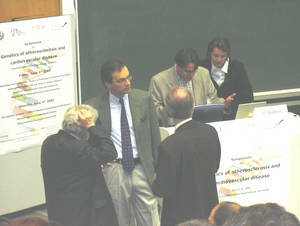 left pictures: Dr. W. Rottbauer (Heidelberg), Dr. B. Ivandic (Heidelberg), Prof. H. Schunkert (Lübeck), Prof. H. A. Katus (Heidelberg) f.l.t.r. 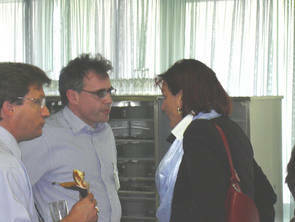 Prof. W. Koenig (Ulm) f.l.t.r.